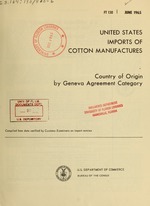 Cotton Statistics, Report FT 130, June 1965.
entry shipments individually valued less than $100 are excluded. the Tariff Act of 1930 (as amended) are also excluded. entered into banded storage warehouse Immediately upon arrival. those presented in the FT 110, IM-145, etc. the table beginning page i of the Septber-November 1963 report. the weight of the cotton component of the commodity only. country of shipment is shown and footnted in this report. available free upon request to the Bureau of the Census. shon in the back of subsequent issues of the report. of Merchandise for Consumption, Coamodity by Country of Origin. AWi 4r a btacqwIn iwprlpa. Oor Ie, 196,4 Cm,. Camt r o *r ari. Jul. 21 1961. enriled "Arrulgeleare Rerd~ngn Inflremnaonal Trde in Co6ton Terle. Duan fo rfw rcefgories i.r.. carded andcooned In rdnd -olJs) l ur no.t howI *erpmrly DIu for c rded Insan ead *odee e included ro IDhe eible under catu oy 26, wil . grnrmant agory daeg o iprty Oct 1964 Carral. S Afroioi Ct / t orW I9&4 C-. 1.lr21 1961 instilled Arlraneall R.a|udlol| aalol Troad. la C.one Tlaillo.." Deu l o u oer nesrill (I.9., c aded icadi.C dliosuodIvollIal -e w o ho en Ipearu Dlp Du I lhi c Irded Io aid e ide i .I. laded ain d Ilh nll d. cd.e y 36. .0 "M.
--. m9 t a li|. about trading conditions and opportuni- Documents. promotion Staff, Office of Publications, U.S.